Material: Made of 90% Nylon and 10% Spandex, 100% band new. These formal satin gloves are silky and incredibly soft, with right amount of stretch, they fit comfortably on most ladies’ hands. Add an Elegant Touch to any Dress: With exquisite fabric, these opera length gloves add depth and texture to any hands, they are fabulous with an ultra classy appearance, which will do justice to any formal clothing. Alluring Gloves with Satiny Sheen: These evening party gloves are simply amazing with a touch of sheen that perfectly for staying refined, grab the attention of every attendee as you glide by with these elegant and beautiful accessories. Perfect Addition to Complete any outfit: These formal gloves are a perfect accessory for Gala, Weddings, Proms, Costume balls, Operas, or any event you wish to catch everyone’s eyes. Measurement: 20.5 inches: with cuff in 3.9 in to 6.6 in (stretchy). 21.65 inches: with cuff in 4.3 in to 7.5 in (stretchy). Plus Size: with cuff in 5.5 inches to 8.0 inches (stretchy). Material: 90% Nylon 10% Spandex. Brand new only. With slight stretch, these wedding satin gloves are comfortable to wear, they are extremely soft with an ornate sheen. Color: White gloves, Black gloves, Silver gloves, Ivory gloves. Package: A pair of long satin gloves for women. 20.5 in:with cuff in 3.9 in to 6.6 in (stretchy). 21.65 in:with cuff in 4.3 in to 7.5 in (stretchy). Plus Size:with cuff in 5.5 inches to 8.0 inches (stretchy). – Satin Costume Gloves: These long satin party gloves are with exquisite fabric which adds an elegant and feminine touch, they will exhibit a luxe yet alluring appeal and make any outfit look classy. 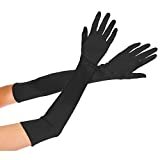 – Women Formal Gloves: With just a touch of sheen, these fancy gloves are perfect the accessory and will complement your look in a beautiful way. – Wedding Bridal Gloves: Not just for bridal, these formal gloves are great addition for any outfit, perfect for Cosplay, Church, Baptism, Easter costume, Halloween costume, Evening Party, Prom, Ball, Opera, Stage Performance, Banquet Occasions, or other Formal Events. These long satin gloves have an ultra classy appearance that add style, grace and refinement to any occasion, they look simply amazing, easily to become the center of attention. 2.The size info is just for reference, it allows 1-2 in. tolerances due to manual measurement. – If you have any questions, pls be free to contact us, we’ll back to you ASAP. – If you are satisfied with our products, pls kindly write a review. Wish you have a great shopping experience.